A Community Hospital supporter holds up his sign during a hearing on a new operator for Community Hospital during the city council meeting in Long Beach June 19, 2018. File photo by Thomas R Cordova. Less than a month after Community Hospital Long Beach closed its doors, the effort to reopen it is ramping up. 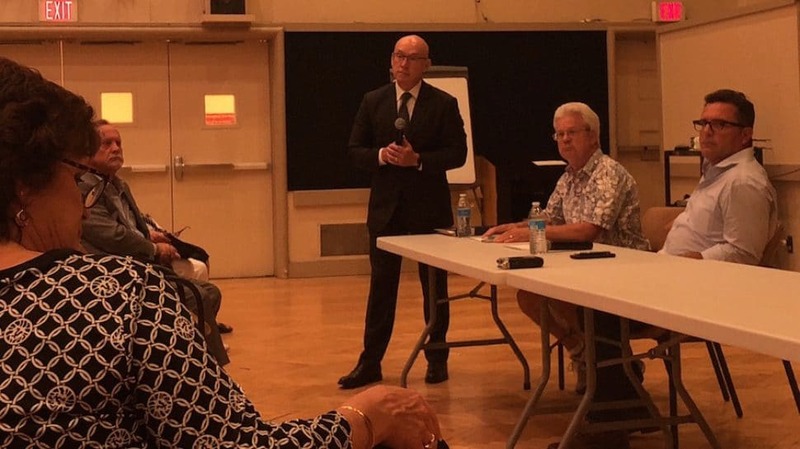 That was the message shared at a community meeting Monday night by city officials and the recently named chief executive officer of the group trying to resurrect the East Long Beach hospital. Incoming CEO Virg Narbutas seemed optimistic that the closure of Community would be brief. He said he wants to have the hospital accepting patients in its emergency room by January 1 or earlier if feasible. The hospital’s former operator, MemorialCare Health System shut down Community in July because of seismic compliance issues that it said were not feasible to fix, but the hospital agreed to suspend its license rather than letting it lapse, which should allow a new operator to reopen the facility sooner. It’s likely that Community will reopen before any seismic reconfiguration of the campus is finished. The new operators have until June to have a plan approved by state regulators, a date that could be pushed back if it’s granted an extension. Narbutas also fielded questions from the crowd at Monday’s meeting. They included: What will the hospital be named? Narbutas said it will include ‘Long Beach’, ‘Community’ and ‘Hospital’. Others asked which employees could be hired before and after the hospital reopens with one woman asking if former Community employees would be tapped first or if those laid off by Molina Healthcare last year would also be part of the equation. The new CEO of Community Hospital, Virg Narbutas (center) met with residents July 30 to answer questions and address concerns. Photo by Jason Ruiz. The hospital still faces a number of regulatory hurdles, but Narbutas said its staff is rounding out with about 300 employees already signed up to return when it does open. The Molina-Wu group will have to work with city architects to draw up a plan to present to the state before the license is reactivated. Long Beach Director of Economic and Property Development John Keisler said there hasn’t yet been a determination about who will pay for any retrofits at the campus, but he said that federal and local tax credits could be a factor. The city owns the land that Community sits on and had previously leased the property to MemorialCare for $1 per year. Keisler said the city is working side-by-side with Molina-Wu to bring the hospital back online with both parties at the negotiating table. “We do feel that we’re moving through process in a very responsible way, and we’re doing it in lockstep with the state regulatory agencies so what we project and what we’re creating will be accessible to them,” Keisler said. Both Keisler and Narbutas seemed optimistic that the hospital could open in a matter of months rather than the typical six- to nine-month window that it usually takes to transfer an operating license. Ray Burton, chair of the Community Hospital Long Beach Foundation, a nonprofit that previously worked with MemorialCare to promote and grow the hospital, said the task force will now shift focus from “saving the ER” to reopening the hospital. He said he hopes the group can help overcome the next obstacle facing Community: getting an extension from the state that could allow the Molina-Wu group a longer timeline to retrofit the campus. Currently the deadline is June 2019, but legislation introduced in the state assembly seeks an extension that could give Community another five years. Burton said he can’t recall how many hours he’s poured into the effort that appears to have ended in victory as Community is poised to reopen. But he deferred any praise, instead pointing to those who showed up to monthly meetings, volunteered and pressured the city to keep the hospital running.